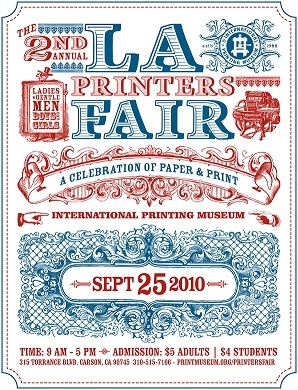 Los Angeles, CA – On September 25th 2010, the International Printing Museum in Carson, CA will be hosting the 2nd Los Angeles Printers Fair. 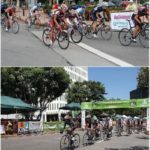 The event, which will last from 9 am to 5pm, will showcase a wide array of demonstrations, as well as printing equipment and products from various vendors. The annual fair, first held last year on August 28th, is the museum’s way of celebrating printing’s rich history. It is also a means to introduce the industry to more people. 2010’s fair, themed “A Celebration of Paper and Print”, will feature activities like the Letterpress “Swap Meet”, gallery tours, and printmaking demonstrations. The “Swap Meet” will allow enthusiasts and members of the public to purchase antique letterpress equipment and other print shop requirements. Tours of the premises will go on for the entire day. These tours will allow people to revisit 500 years of printing history, escorted by knowledgeable guides. Another highlight of the fair is the exhibit, “The First Industrial Revolution: The Printed Book from Gutenberg to Franklin.” International Printing Museum’s Book Arts Institute Director and volunteer fair director, Rachelle Chuang, is “excited to invite people to see the collection of noteworthy books from the 15th to 19th centuries”. ‘Visitors will have a chance to see the rare, antiquated tomes with their own eyes. Some of these priceless books are St. Augustine’s Civitate Dei; the Malleus Maleficarum, a manual used by the officials for the Roman Inquisition; a London imprint of writings by Girolamo Savonarola, a Dominican priest who was ironically known for book burning and censorship; as well as books from Benjamin Franklin’s press, to represent printing during the American Colonial Period. These books, plus several others, are not part of the regular museum exhibit; they will only be displayed for public viewing for the duration of the fair. The International Printing Museum, whose goal is to “take one of the world’s most significant collections of antique printing machinery and interpret it for today’s audiences through working demonstrations and theater presentations,” has joined efforts with various sponsors to bring the 2nd Annual Los Angeles Printers Fair to life. UPrinting.com is one such sponsor. Visitors may pre-purchase tickets for the September 25 event online at www.printmuseum.org/printersfair/purchase-tickets/ . Prices are $4.00 for students and $5.00 for general admission.